Get ready for Halloween with a pumpkin mask! Your child will practise drawing and cutting out triangles when he's making his half-face mask. As soon as he dons the finished mask, he can surprise his friends, ensuring Halloween-y delight for all. 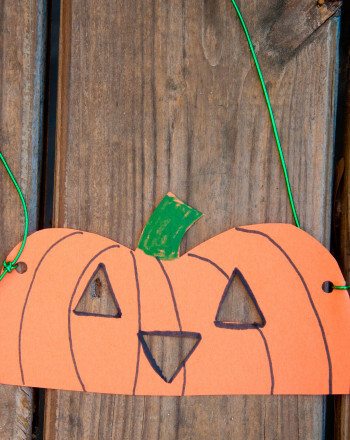 Help your child draw and cut out half of a pumpkin shape on the orange paper. Ask your child to point out where he would put the eyes and nose on the jack-o'-lantern. Have him draw two upright triangles for the eyes and one upside-down triangle for the nose. Help poke a tiny hole in one of the eyes and have him cut along the line to cut out the triangle. Repeat for all three triangles. Ask him to outline the three triangles and then draw curved lines for the pumpkin. Have him paint the stem of his mask green. Help him punch one hole on either side of the mask. Encourage him to tie the cord through both holes so the band fits comfortably over his head. This mask is especially great because it won't cover your child's entire face. He'll be able to see quite easily and you'll be able to see most of his face, so it'll be easier to keep track of him.